It is always so sad to read in the newspapers of people who die alone in their homes, their bodies lying undiscovered for weeks or even months. They may have lost touch with their families or have run away or perhaps lost their own loved ones. But what if there is someone behind these deaths? Police intelligence analyst Annabel discovers the body of her neighbor, “horrifically distorted out of shape”, the stomach a mass of maggots, and in the course of her work, begins to realise that there has been an unusually high number of similar deaths in Briarstone. But as these deaths are not technically crimes, they have not been flagged by the police and no one is really interested in pursuing them, until journalist Sam Everett comes nosing his way in. And then there is Colin. Colin is perhaps one of the creepiest characters I’ve ever come across. He comes across as mild-mannered and relatively ordinary (if a bit socially inept), but his inner dialogue is just so disturbing and twisted. He has this ability to manipulate the emotionally vulnerable, such as those who are depressed or who have recently had a death in the family, for instance. He is quite convinced that he is helping them, easing them towards their inevitable fate. Yet he derives a sort of sexual pleasure from it all. Creepy? Disturbing? Unsettling? Yes, yes and yes. Annabel is the sort of person who could potentially be one of these victims: single, living home alone with her cat, seldom mixing with colleagues or meeting friends. And as such, it is inevitable that the two of them meet…. I can’t seem to get away from the word ‘creepy’ in this review. Because it is undoubtedly so, with its roots in reality. 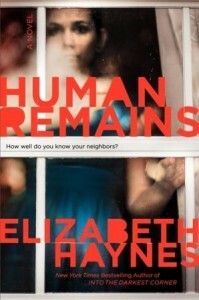 Human Remains is a dark thriller, written by a someone who knows how to provoke strong emotions from her readers. In case you’re interested, she details the five books that changed her life in Crimespree Magazine. Elizabeth Haynes is a police intelligence analyst, a civilian role that involves determining patterns in offending and criminal behavior. She is also the New York Times bestselling author of Into the Darkest Corner and Dark Tide. She lives in England in a village near Maidstone, Kent, with her husband and son. Thanks Heather! Ugh, Colin is so creepy….